Intro: Asia is arguably the region where I can add the most value on this site; I grew up there and have been traveling around the region since childhood. The first time I visited Bali was in 1988 and I’ve had the good fortune of returning many times since, including most recently last summer. 25 years later, much has changed thanks to development, a growing population, and sadly, terrorism. Locals and longtime Baliphiles may tell you that they long for the good old days or that the place to be has moved on to nearby Lombok or beyond. But if you can accept the higher prices, the rush hour traffic, and the growing pains that come with rapid development, the “Island of the Gods” still offers a rare combination of stunning natural beauty and infectious energy. My first Bali travel guide consisted of an email I wrote ten years ago for a friend who eventually wound up loving the place so much, he purchased a villa there (and did so on HGTV’s “House Hunters International”). Some of the places I recommended then have come and gone, and as this is only “Part One,” take this entry as something of an overview, which I will refer back to in future posts covering different aspects of the island (such as surfing, diving, exploring, spas, dining, places to stay, etc.). Arrival and Visas: First things first, arrive in Bali prepared. Check the latest visa information. Do note that overstaying your visa in Bali is essentially not an option so make sure you read up on your visa requirements first. For many countries, you can obtain a 30-day visa on arrival when you land in Bali (note prices have now gone up to $35 US for most countries for a 30 day visa–save yourself the trouble and bring exact US dollar cash); if you want a 60-day visa, you’ll have to apply ahead of time. The Lonely Planet, as always offers you details. Where to Stay: A typical week-long trip to Bali will consist of some beaches, temples, sunsets, dinners, a trip to Ubud, spas, and possibly some diving and/or surfing depending on your interests. 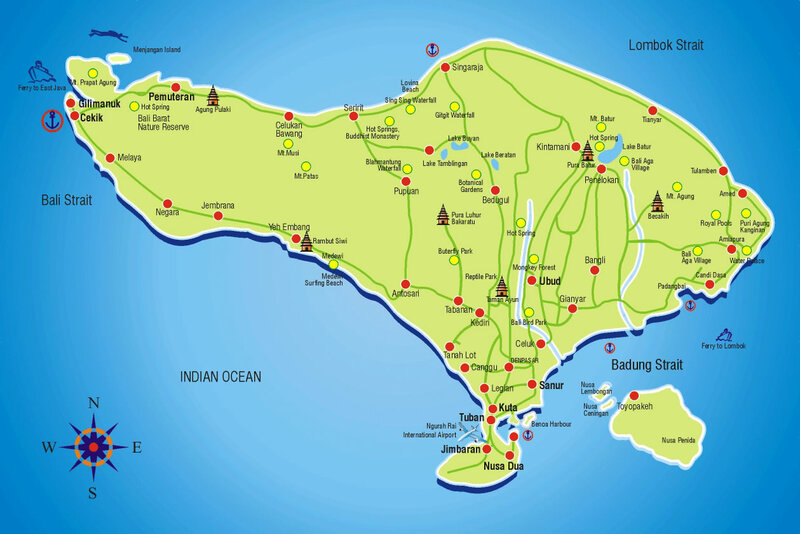 Most hotels are located in the southern portion of the island (see map here), and if only there for a week, the majority of people will not venture past Ubud to the north. Bali is not a small island and with the explosion in traffic, especially around Denpasar where the international airport is located, even a trip from the hotels in Seminyak to Ubud can take up to two hours if you get caught at the wrong time of day. The southwest side of the island, in and around Kuta Beach, is the busier tourist area. Here you will find many shops, restaurants and bars, stunning sunsets, and accommodations ranging from boutique villas to basic hotels, and youth hostels to five-star luxury resorts. The beaches on this side tend to be a little bit less pristine than other, quieter parts of the island, but the convenience is hard to beat. If you want calmer beaches for smaller children, the area around Nusa Dua on the southeast side is usually calmer (*Note Bali is a world class surfing destination for good reason so be safe and check the reports before you go). This area tends to also be favored by Eastern Europeans with “European” sunbathing practices, so that is a potential issue (good or bad) for you to mull as well. Villa or Hotel or…? : Once you’ve decided on the area where you’d like to stay, you’ll want to consider your priorities for types of accommodation. Many people go to Bali specifically to stay in a boutique villa property, with your own plunge pool and a luxurious open plan. These tend to be very good value, especially if you have a large group, but they do come with their fair share of potential problems. Electricity that doesn’t work (no A/C?! ), snail’s pace WiFi that costs an arm and a leg, potentially inconvenient locations (15+min walk into town or to the beach), etc., are some of the issues you may encounter. Maybe those issues don’t matter to you, and you could also get lucky and do very well in these villas (all things being equal) I tend to prefer the villa option over a cookie-cutter resort hotel), but bear in mind you need to do some research if it is your first time (email me and I’d love to help you–I’m not paid to endorse anywhere). There are, of course, more and more five-star resorts popping up all over Bali. I’ve stayed in a few of these and made day trips to the bars and restaurants of others. Again, I’m happy to share my thoughts if you have any places in mind. Prices have gone crazy in Bali in this area. It used to be that a five-star hotel in Bali would cost less than half what it would cost in Hawaii. Now they are pretty comparable. If you’re new to Southeast Asia and want to experience something very different from your Mediterranean or Caribbean holidays, I would steer you towards the villa options. If you’re on a bit of a budget, there are still some cheaper hotel and hostel options around, especially if you don’t have a huge need for amenities (why hang around a mediocre pool when you have the beach to go to anyway?). But if you have a group of friends with whom you are going, again, look into villa options. Some spots can work out to less than $50 a head for a large, multi-bedroom villa with a private pool for you and your friends to share. It’s hard to find that kind of deal and experience in the West. How would you like to be there? Once you’re settled in what is hopefully your little slice of paradise, you’re going to want to go explore. And we’ll have a look at that in Part Two. George – I’d never even THOUGHT about going to Bali, but looking at your stunning images makes me want to start packing! How are you? Well, if you ever get the inclination to go to any part of Asia to go try out your lens baby, just let me know and I will gladly fly over and show you around as well! Here are some I took of Bali and Java. Looks like you stayed in nicer plabes than I did…maybe I need to start ‘backpacking’. Loved the post! Excellent photos, Phil. Regretfully when I was in Bali/Java on past occasions, my eye wasn’t as trained as it is now, so I actually am pretty unhappy with my photos, but yours are fantastic. Borobudur is spectacular, isn’t it? I love your street/candid work, though. Thank you very much for stopping by. I am getting ready to embark on my first solo backpacking adventure and I’m starting off in the Uluwatu area, any recommendations for hostels or super cheap hotels? Thanks for your comment, Leland. Good luck with your villa.